Studio Calico: Friday Inspiration...1st Edition. 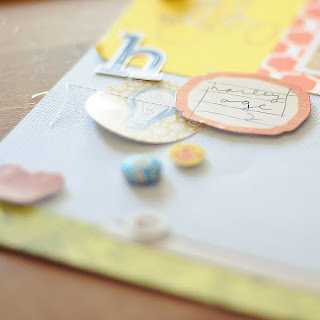 this is the first of TWO Inspiration installments for today...and who better than our May Guest Designer, Jennifer Johner to provide us with something to get us revved up for National Scrapbook Day?!?! honestly, i'm not quite sure where to start. i have been a HUGE fan of Jennifer's for the longest time, and i just think she is crazy talented. in this layout here, she combined both HomeFront and Anthology to document a fun photo of her little guy. (this one makes me smile, because my daughter STILL loves tub time, and she will be eleven in a few weeks, lol!) let's try to break it down a bit... i think the quality that i am most envious of in Jen's work is her ability to use lots of little details without making it look over the top. my personal taste runs a bit on the 'clean' side...yet i love lots of details. her work combines both of those elements and hits the mark every. single. time. the FabRip ruffled at the top of the page, the random Anthology Stickers floating about, the mix of the Anthology and HomeFront alpha stickers...sigh. each one a perfect addition that adds to the page without distracting from the message. my profession of love for Jen's work. please check her blog HERE...and her Studio Calico gallery HERE (just click on her image). both are DEFINITELY worth your while! and thanks Jen, for providing us with so much inspiration this month!! love how all the bits stand out.